Handcrafted hanging by artisans in India. Made from Iron using Eco-friendly principles. Keeping in mind the clients' variegated demands and requirements, we are engaged in offering Hanging Ornaments in market. These beautifully designed and crafted items are widely known for their attractive look, eminent shapes, and unique patterns. Owing to their exceptional features, these are highly praised among the clients. Here it is handmade Tricky Puzzle Two Keys operated Iron padlocks, It has done beautiful brass copper and silver fittings to give it a great and unique antque look. These are the Replica of ancient Indian padlocks. We are pioneers in the fabrication of unique collection of Christmas Hanging Ornaments in exclusive shapes and designs. Our range has ability to blend any type of interiors. These are produced from optimum quality materials such as paper, metal, wood etc. Our exclusive collection of sparkling Christmas Decoration improves the beauty of your Christmas tree. 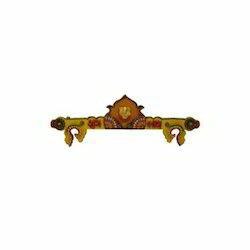 Our organization is indulged in offering Hangings Ornaments to our clients. 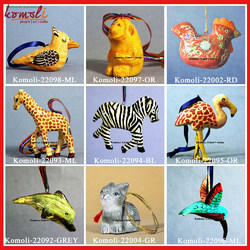 These Hangings Ornaments are basically used for decoration purposes in homes, hotels, offices and restaurants. We odder these Ornaments with high glossy finish and shine. Our patrons can avail from us a broad range of Hanging Fish. We are providing these products at low prices to our customers.